Powervault works with qualified electrical installers around the UK. Powervault will only offer electrical installers ‘approved’ status once they have passed the trade background checks and have successfully installed their first Powervault in a customer’s home under Powervault’s supervision. Warranty claims and servicing on existing Powervaults are only valid if the Powervaults were wired into customers’ homes, connected to the internet and registered online by an approved installer. Customers can check the details of their nearest approved Powervault installer by inputting the installer’s unique ID number into the ‘Check Your Approved Installer’ search tool. 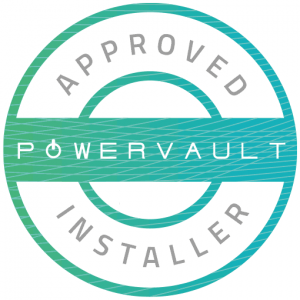 Powervault works with accredited solar installers across the United Kingdom to ensure that every installation is installed correctly and efficiently. If you are interested in becoming a Powervault installer please get in contact with us. Register your customer’s Powervault to give them access to the online Powervault portal and place their Powervault under warranty. To check the contact and trade details of your nearest approved Powervault installer please type in their unique ID number into the search tool. "Powervault do everything they can to make sure customers are happy and their energy storage system is working perfectly; one of Powervault's engineers drove from London to North Yorkshire to meet us at our first Powervault installation, train our electricians and ensure everything was operating correctly for our customer"